more about each of these interesting homes. 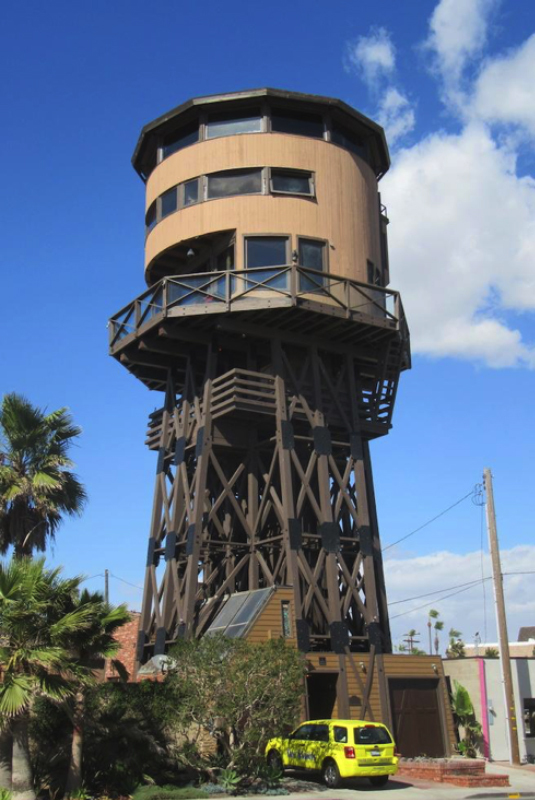 Yes, the house is actually an old water storage tower whose wooden tank reportedly held 75,000 gallons years ago. Definitely one of the more creative and unique examples of adaptive reuse, repurposed as a dwelling of 2,800 square feet replicating the look of the original tank, built in the mid-1980’s on a postage stamp lot. The structure stands 85 feet tall, with unsurpassed ocean, coastline and city lights view in all directions. It was purchased for $800,000 in 1995, listed for $8 million in 2005-06, and recently sold for $1,500,000 in 2016. You can even check it out in person if you want, since the property is utilized as a vacation rental on VRBO. This beachfront mansion was originally conceived on the back of a napkin, and evolved into something resembling a Medieval castle, definitely a standout in this small beach community. 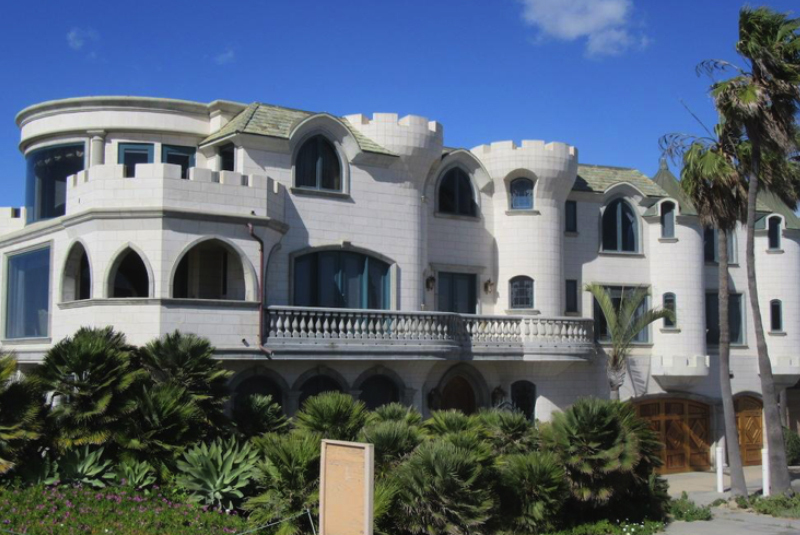 The house was built in 1991, with three stories and over 7,000 square feet, apparently getting its name because of the two prominent turrets, parapets and limestone exterior resembling a sandcastle (sandcastle-building contests, by the way, are very popular in several nearby beach communities). 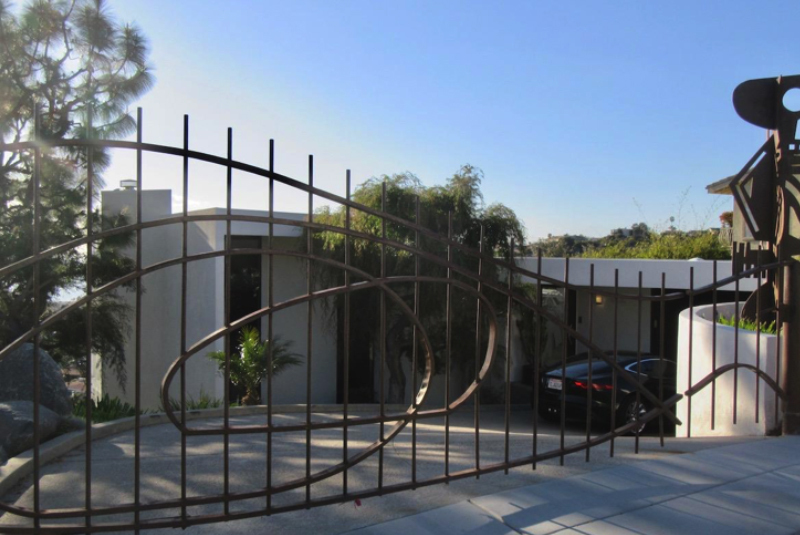 Reportedly offered for $10.8 million in 2014, recently listed for $8,988,000, currently on the market for $7.4 million. Here is a cool YouTube video with more information: https://www.youtube.com/watch?v=CPpuAv6_PFQ. 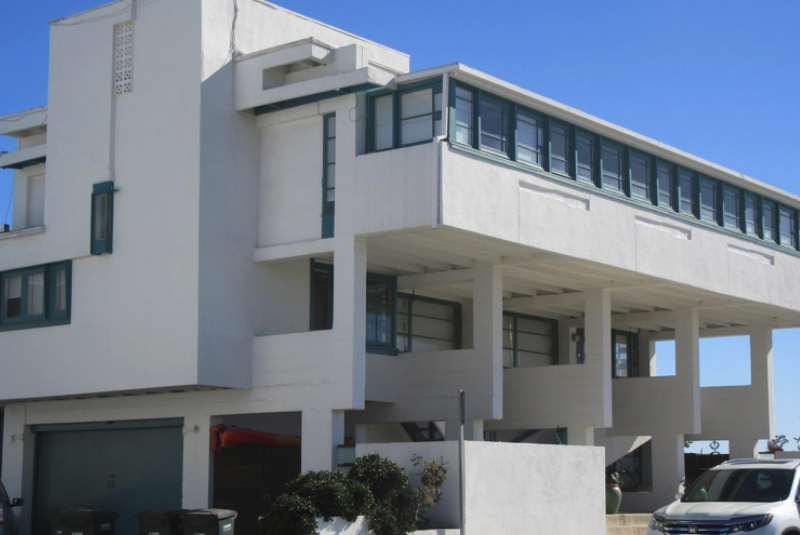 Situated on a corner lot along the boardwalk facing the ocean, this house might not immediately stand out to passerby, but it is actually a celebrated architectural masterpiece, recognized as one of the most important works by modernist architect Rudolf Schindler. Construction is concrete, notable for a dwelling built nearly a century ago, with elevated living area supported by a distinctive skeletal concrete frame. Constructed in 1926 with 2,740 square feet of living area, the property was added to the National Register of Historic Places in 1974. The home was built for Dr. Philip Lovell, a noted naturopath of the time, and is still owned by the Lovell family. 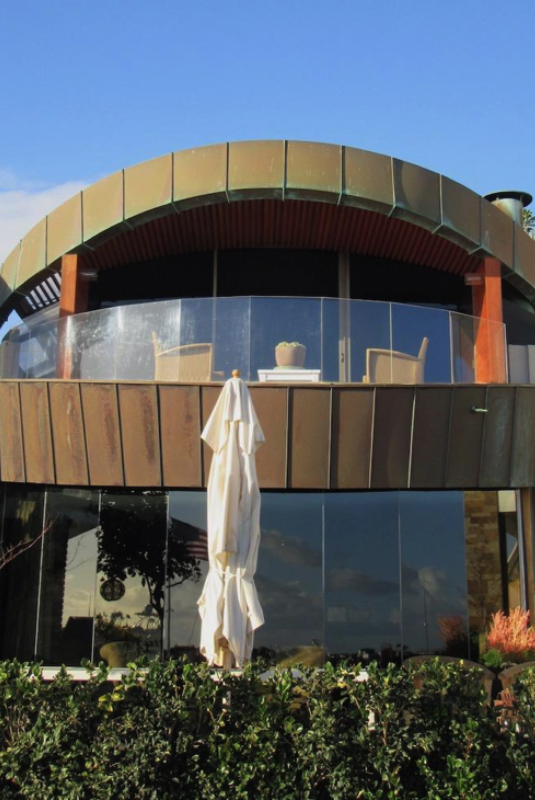 Named after the original owner who commissioned the design from celebrated modernist architect John Lautner, the property’s exterior also earned it the name “Jaws,” after the famous 1975 movie. 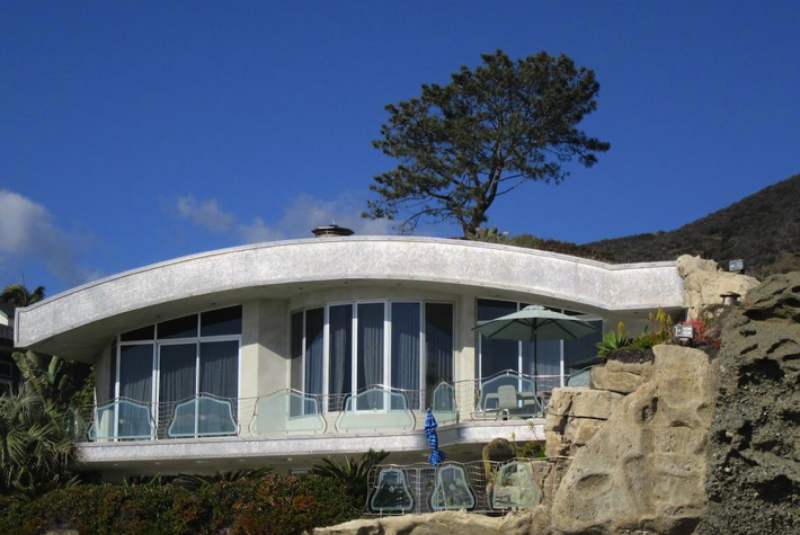 This certainly isn’t among Lautner’s best-known works, but it makes masterful use of a narrow interior oceanfront lot along the island’s boardwalk, including a retractable glass façade on the lower level. Built in 1979, the home has 2,100 square feet, and recently sold in 2016 for $3,772,500, after having been on the market for a number of years. Situated on three oceanfront lots abutting a private cove, this home was a collaboration between the original owner and well-known local architect Brion Jeannette, who endeavored to create something he described as “stealthy and organic,” and “a home that really sets into the land,” drawing inspiration from the curvelinear shapes of Antoni Gaudi and John Lautner. The compound is indicated to have 30,000 square feet of living area, and was built in 1998 at a reported cost of $33 million. Notable features include curving glass walls, a vintage movie theater, soda shop, bowling alley, car museum, outdoor grotto and two pools. The property was listed for $75 million from 2006-09, the nation’s second-highest asking price for a home at that time, featured by Oprah and a cover story in Ultimate Homes magazine. The property ultimately sold for approximately $34.1 million in 2010, although additional consideration was rumored to have brought the total price closer to $40 million. William Lyon is a decorated Air Force major general who flew combat missions during the Korean War, perhaps better known as the founder of William Lyon Homes and Lyon Air Museum. 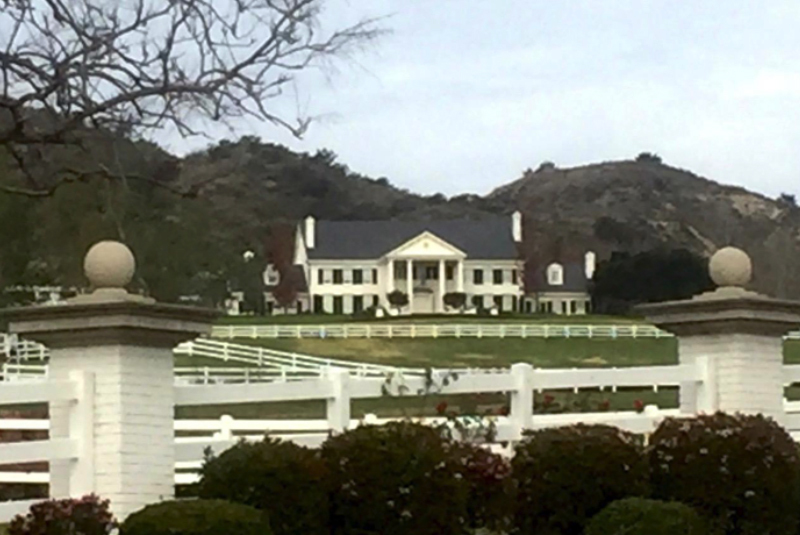 Lyon’s estate in Coto De Caza sits on 137 acres, with one of the county’s largest homes and a complex of structures built in the 1980’s, which might be mistaken for a hotel from the street; among the property’s numerous amenities is a 15,000-square foot showroom for Lyon’s car collection and what was once the county’s only residential helipad. A proposal is pending to carve out the southerly 64 acres of the estate for subdivision into 25 two-acre lots. 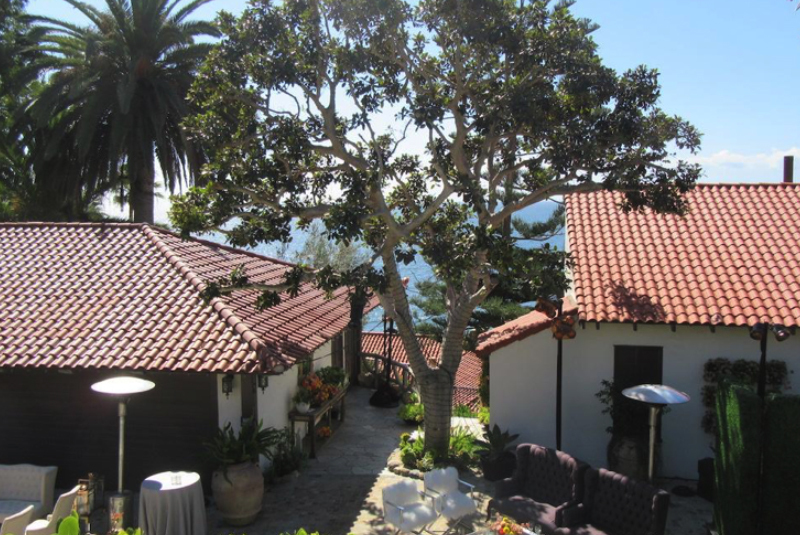 This estate sits on a half-acre blufftop lot overlooking the Pacific Ocean, with access to a private beach below. Also known as “Mariona,” it was built by Frank Miller, the developer of the Mission Inn in Riverside, nearly 100 years ago as a wedding gift to his second wife Marion. The compound has 12 bedrooms contained within a main house and several villas, with over 8,000 square feet of living area and a large motorcourt. It was purportedly built mostly by hand, and exudes a definite “old world” charm. In its storied past, the property was a favorite of the Hollywood elite, and was listed on the National Register of Historic Places in 1984. It was last sold via auction in 2012 for $12,750,000 (although other sources indicate a price of $14.5 million), after having been listed for upwards of $30 million. I was honored to have had an opportunity to tour this magnificent property before it sold. With a few modern updates, it has recently been listed again for $30 million, and if you want to check it out in person, you can actually rent it for a minimum of a month at a cool $341,000. This short YouTube video was produced in connection with the auction back in 2012: https://www.youtube.com/watch?v=s0M0x5GFqlA. This is the oldest house in Laguna Beach, built in 1883 by the Harper family, who lived there through 1945; it was the childhood home of Thomas Harper, a noted Laguna architect of the 1920’s and 1930’s. It is slightly over 1,500 square feet, with additions and renovations over the years. Marketed as a possible teardown in 2006 before selling for $2,850,000, the property sold again in 2008 for a reported $3.8 million to an investment group, who proposed another renovation and expansion of the dwelling, and construction of a second unit on the property. When it comes to development issues, nothing is ever easy in Laguna Beach, and debates about the historical significance of the property (it is listed on the city’s Historic Register) generated plenty of controversy. The project was eventually approved, and a second dwelling unit was completed in 2016. 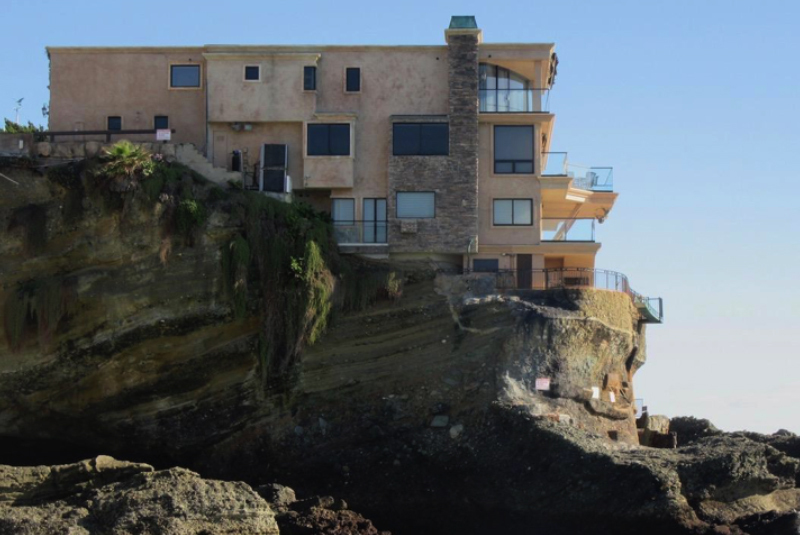 This legendary beachfront property was literally carved out of a rock formation abutting Aliso Creek, a signature creation of local architect Brion Jeannette that has been described as “a curated piece of real estate art,” and was once featured on HGTV’s “Most Amazing Homes.” The residence was built for tech entrepreneur Dennis Morin, and inspired by the legendary Catalan architect Antoni Gaudi, with nearly 3,000 square feet built in the mid-1990’s. It was first listed in late 2013 for $15 million, ultimately selling for $6.5 million in late 2016 after three years, and reselling a year later for $7.2 million. Here is an excellent YouTube video about the creation of the project narrated by the architect: https://www.youtube.com/watch?v=Is34PPQW3Ag. One of the more unique locations, even for Laguna Beach, this property is perched on a promontory that extends into the ocean between Table Rock and Totuava Beaches, affording spectacular 300-degree views. The dwelling was built in 1982, containing approximately 4,700 square feet. The property sold for $6.2 million in 2003, and reportedly sold for $10.5 million in late 2006, before falling into foreclosure in 2008. It was marketed for sale at prices up to $20 million in 2009 and for lease at $45,000 monthly, ultimately purchased at trustee sale for $9,550,000 in 2011. The property is apparently on the market again, with its own website featuring a nice little video: http://31721seacliffdrive.com. Located along a ridgeline in San Clemente overlooking city lights and the Pacific Ocean, this dwelling was designed by noted San Diego architect Wallace Cunningham, who touts his intuitive approach to residential design. The house was completed for surf photographer Jeff Divine in 1988, a contemporary structure encompassing over 2,100 square feet. The property sold for $1,550,000 in 2014, and again for $1.7 million in early 2017. Here is a link to the architect’s website with a slideshow highlighting some of the home’s design features: http://wallacecunningham.com/projects/seaview. 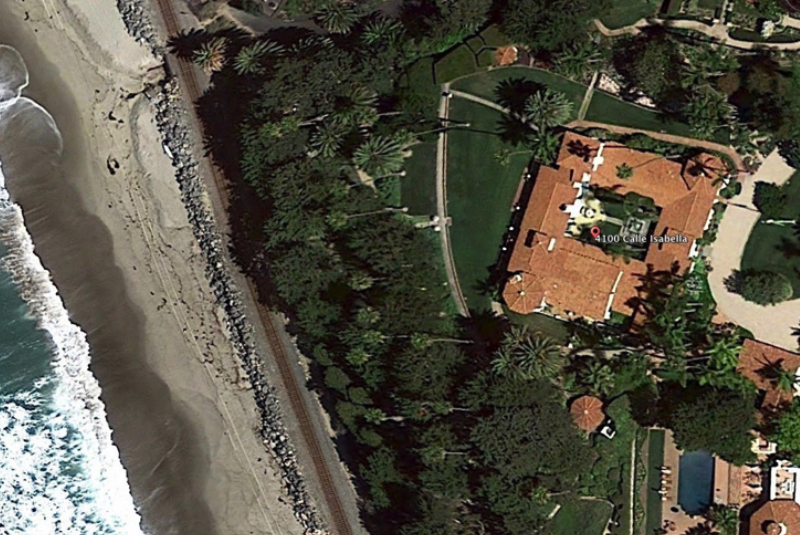 Beachfront estate of the famed actress, perched on a bluff above Woods Cove. 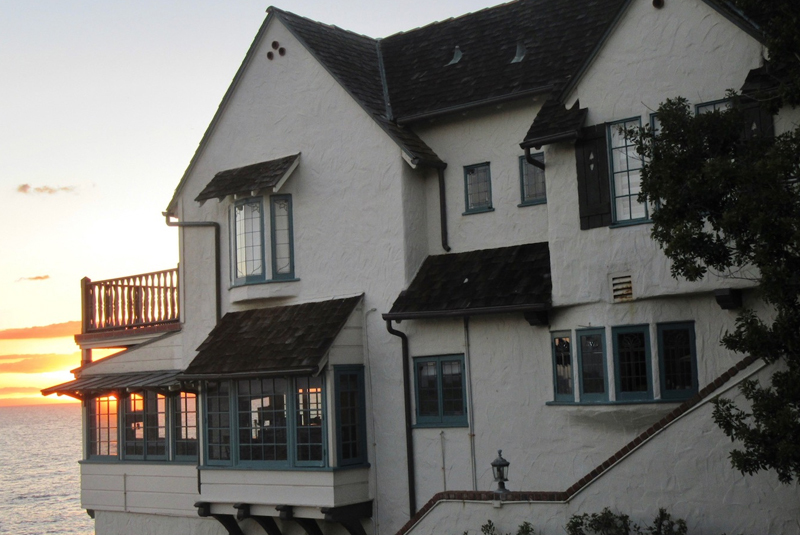 The Tudor dwelling was built in 1929 for a wealthy newspaper publisher, and designed by well-known Laguna architect Aubrey St. Clair; the property was purchased by Davis in the late 1940’s, after meeting her then-husband at Mariona (see above) a few years prior. It was here that she read the script for “All About Eve,” one of her most famous movies, which was nominated for 14 Academy Awards, and won an Oscar for best picture in 1950. 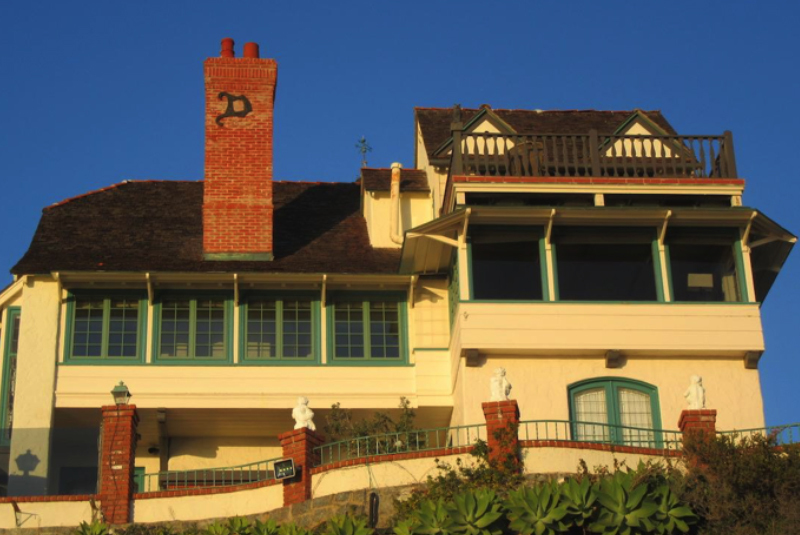 The main residence and guest house encompass nearly 5,400 square feet, and the letter “D” that Davis installed on the fireplace is still visible from the beach. The property is listed on the city’s Historic Register, last sold for $13.5 million in 2004. Davis famously told Johnny Carson during an interview that the Laguna Beach house was her favorite. Situated on two lots encompassing nearly an acre, and occupying a prominent corner location in Santa Ana’s Floral Park neighborhood, is a home that was built in 1939 for the Maharajah of Indore, one of the wealthiest men in the world at the time. The Maharajah, his American wife and young daughter occupied the home for only a year before returning to India, and then divorcing in the early 1940’s. 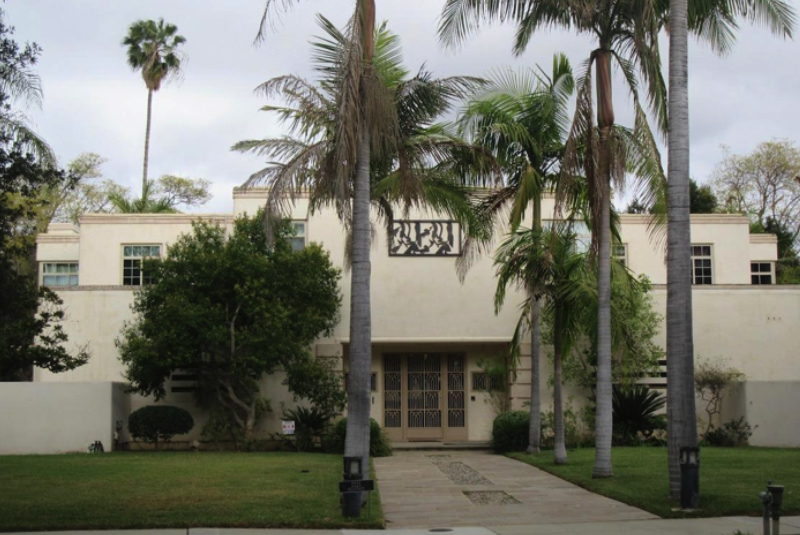 The dwelling is Art Moderne style with slightly over 6,100 square feet, originally protected by bullet-proof glass and bodyguards, for fear the daughter might be kidnapped like the Lindbergh baby. The home was purchased for $730,000 in 1988, and the current owners have spent years battling a leaking roof and windows, along with the City of Santa Ana, who unilaterally placed the property on the city’s Register of Historic Properties in 2003. 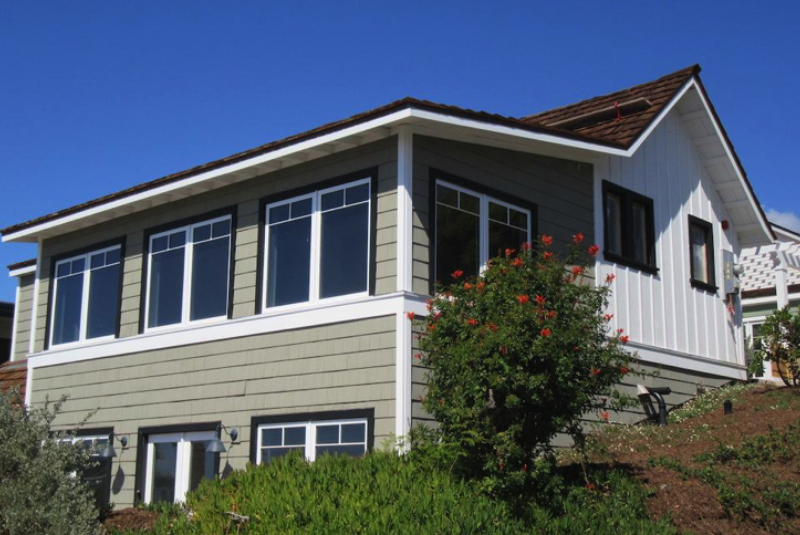 Most recently, the owners faced misdemeanor charges when they replaced a number of the original steel casement windows without proper permits. This might inspire a future look at some other historic, unusual or otherwise noteworthy Orange County homes . . . stay tuned.